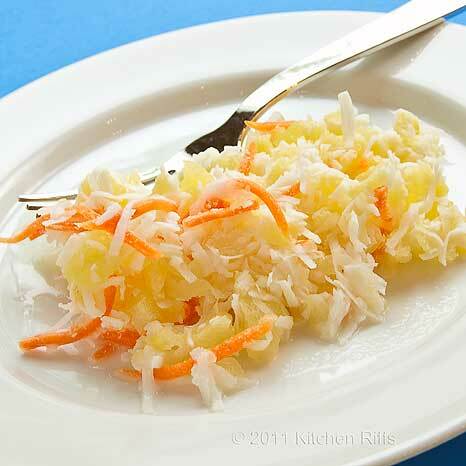 With only 3 ingredients — canned crushed pineapple, packaged angel-flake coconut, and grated carrots — this salad is about as easy as it gets. When I was growing up, this is a salad my mother would often serve on festive occasions. Visually, it’s a pretty dish. And it has a pleasant, sweet taste that almost everyone likes. In fact, it rivals some desserts in sweetness. If you have trouble wrapping your mind around a sweet salad, just think of it as a loose-textured relish or nonspreadable chutney. But however you classify it, once you taste it, you’ll call it delicious. This recipe is from my own mom, Mother of Kitchen Riffs. She learned it from watching her grandmother make it. This is the sort of recipe that can be made in almost any quantity. The critical measurement is the canned pineapple. Since all the other ingredients are added in proportion to that, the amount of pineapple you use determines how many servings you’ll get. 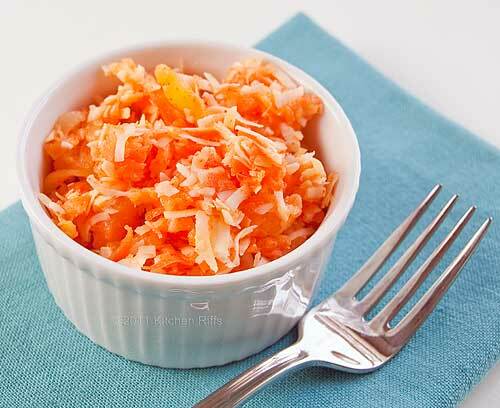 The recipe below will yield about 6 to 8 servings. It keeps (refrigerated in an air-tight container) for about a week. As Mother of Kitchen Riffs notes, you need to “eyeball” the ratio of ingredients. “Maybe a third of each ingredient, perhaps a little less of the coconut.” I provide measurements below, but feel free to alter to suit your own taste. In fact, with this recipe, that’s almost mandatory. Open can of pineapple, drain well in a sieve. Meanwhile, clean and grate the carrots. Refrigerate until well chilled (about 2 hours). Remember that this is a free-form recipe, and you should add ingredients in a ratio that is pleasing to you. To my taste, it’s important for the flavor of the pineapple to dominate. You may prefer otherwise. I’ve seen, but haven’t tried, versions of this recipe that include raisins. A handful of raisins might make a welcome addition (simmer the raisins for a few minutes to refresh them, then drain and add to the mixture). Adding just a bit of cayenne pepper (for me, maybe a third of a teaspoon) provides a nice ping that contrasts well with the sweetness of the dish. I think this recipe is particularly well-suited for picnics, where many people like to serve a mix of savory and sweet dishes. The first big summer picnic opportunity (Memorial Day) is coming up but you still have plenty of time to lay in the ingredients for this dish. Speaking of laying in — or maybe that should be lying in — this is a short post because the Kitchen Riffs household is officially on vacation this week. But don’t worry, we’ll bestir ourselves enough to get something decent to eat. And drink. Who says life is no picnic? This salad was an Easter tradition as well, very tasty with ham, asparagus, scalloped potatoes and other traditional Easter fare. Added bonus: children of all ages love it! Transports well and great for picnics. Thanks for the comment, Sister of KR! Easter was indeed one of the festive occasions where this salad was served, and as you point out, a fine addition it was. But with all the summer picnic opportunities coming up, no need to wait to sample this truly tasty dish. This reminds me of an ambrosia salad which was a favorite of mine in the 70s. I've never actually made this myself but now that you've posted this I have to make it. Actually my carrot cake has all these ingredients in it and then some. Sounds delish! 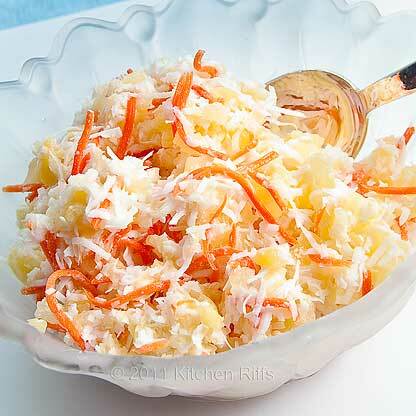 Hi Vicki, this is similar to ambrosia salad. There are several differences - this one doesn't have whipped cream or marshmallows, both of which are often in ambrosia salad. But the overall taste is in the same ballpark. It's a fun salad both to make and to eat. Thanks for stopping by.